Cape Cod’s Best Bed and Breakfasts were recently identified by the Travel Channel. There are over 250 bed and breakfasts throughout Cape Cod. The Travel Channel article by Christopher Setterlund identified the top ten spanning from Upper Cape Cod through Mid Cape and Lower Cape Cod out to Outer Cape Cod. As members of the Cape Cod Chamber we are very familiar with the wonderful hosts and properties that the Travel Channel identified. Read on to learn a bit about these top ten bed and breakfasts. The Captain’s Manor Inn is honored to be one of these top ten Cape Cod’s bed and breakfasts and the only one located in Upper Cape. Located in Falmouth Village, guests love the ability to park the car and stroll to the many boutique shops, restaurants, museums and beaches. Enjoy the Shining Sea bike path and the many walkable gardens and museums in town or perhaps a game of golf, fishing, kayaking, or sunset cruises are on your list. Explore our day trips page for ideas ranging from day tripping to Martha’s Vineyard to sailing off for a whale watch. We are also thrilled that The Platinum Pebble Boutique Inn is named as one of the top ten Cape Cod bed and bre akfasts by the Travel Channel. In 2014 The Captain’s Manor Inn partnered with The Platinum Pebble to offer our 2 for 1 package that has been extremely popular with our international guests and our domestic guests. We essentially ease the planning of your Cape Cod vacation by creating a week long package where you spend 3 days at each of our two Inns and during your stay you will day trip to Martha’s Vineyard, Nantucket, Heritage Museums and Gardens, plus enjoy a Whale Watch adventure and bike the Shining Sea Bikeway and the Cape Cod Rail Trail. All your ferry and admission tickets are included as part of the package. By staying at The Captain’s Manor Inn in Upper Cape Cod (near Martha’s Vineyard) and Lower Cape Cod (near Nantucket Island) guests of the 2 for 1 package essentially see all of Cape Cod and the Islands during their week long stay. The other lovely bed and breakfasts named by the Travel Channel span from Mid Cape to Outer Cape. In the Mid Cape you will find Captain David Kelly House located in Centerville. Rick and Tom have been welcoming guests to their bed and breakfast since 2009. Their breakfasts are entertaining and delicious. One of our favorite places to enjoy while in Centerville is the renowned Four Seas Ice Cream which is not far from Craigville beach. Another wonderful bed and breakfast in Mid Cape is Liberty Hill Inn which is located in Yarmouth Port. The Inn is set back from historic route 6A on a little hill. It is always great fun to drive Route 6A and enjoy the many unique antique shops along the route and view beautiful historic Cape Cod homes. A third bed and breakfast in Mid Cape honored in the Travel Channel top ten Cape Cod bed and breakfasts is the Lamb & Lion located in Barnstable. Ali and Tom have exceptional hospitality experience and their Lamb & Lion Inn is located along the scenic and historic 6A and is a renowned pet friendly bed and breakfast. 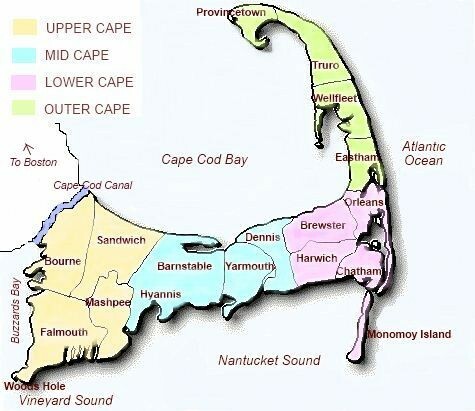 As you travel east in Cape Cod you will now move from Mid Cape to Lower Cape Cod. In addition to The Platinum Pebble Boutique Inn there are 3 other Lower Cape Cod bed and breakfasts honored by the Travel Channel in their Cape Cod’s Best Bed and Breakfasts selection for 2015. First we travel to the Old Harbor Inn in Chatham Cape Cod. Chatham is a quintessential Cape Cod town with a walkable village style center. Some of the favorite spots we like to visit in Chatham are the working Fish Pier and the Chatham Lighthouse Beach and Lighthouse. Next as you traverse the Lower Cape would be Brewster by The Sea Inn and Spa located in the historic Sea Captain’s town of Brewster. A thoroughly enjoyable activity to undertake in Brewster is to bike along the Rail to Trail Bike path which spans 22 miles through Dennis in Lower Cape Cod to Wellsfleet in Outer Cape Cod. After your bike extravaganza you can enjoy a treatment in Brewster by the Sea Inn and Spa’s fully licensed Spa. Another of the top bed and breakfasts as noted by the Travel Channel in Lower Cape Cod is A Little Inn on Pleasant Bay. This Orleans Bed & Breakfast sits between the historic villages of Chatham & Orleans right at what many refer to as the “elbow” of Cape Cod. Located on Pleasant Bay in Orleans the Inn has beautiful water views and a small beach as well as a dock. We now leave the Lower Cape to head to the Outer Cape. There are two remaining Bed and Breakfasts to talk about in the Travel Channel designation of top ten Cape Cod bed and breakfasts. These two bed and breakfasts are located in Eastham and Provincetown. In Eastham you will find the Whalewalk Inn and Spa.The property was originally built in 1830 for a renowned whaling captain and was subsequently a farm before it was purchased and turned into a bed and breakfast in 1953. A highlight of the marshes and open waters that surround Eastham is that they provide some of the best kayaking and canoeing on the Cape. A short 10 minute drive from the Whalewalk Inn on the way towards the Outer Cape is the famous National Seashore. The Cape Cod National Seashore was created on August 7, 1961 by President John F. Kennedy. This national treasure encompasses over 43,000 acres on the Atlantic Ocean side of Cape Cod and in addition to beachfront includes ponds and woods. Last but not least is the 8 Dyer Hotel bed and breakfast in Provincetown. Brandon and Steve are your hosts at this beautiful and intimate bed and breakfast located in walking distance of such landmarks as the Pilgrim Monument and the Provincetown Art Association and Museum. It is also just a short walk to the famous Provincetown Commercial Street. Brandon is a chef trained at the Culinary Institute of America so you can expect a yummy breakfast. We hope you have the chance to visit several of Cape Cod’s best bed and breakfasts.